We are currently working on our annual catalogue mailings. If you would like to add yourself to our list or simply stay on the list please let us know! To sign-up, please complete this form. Take a journey through a 21st Century Science Classroom. Through the use of various PASCO sensors and integration of a variety of apps, an inquiry-based classroom becomes an engaging and authentic place to collect and share data. Learn how to take old “cook-book” labs and redesign them to meet the needs of a diverse 21st century classroom. By making small, easy changes to existing labs to increase student engagement through student voice and allowing students to differentiate labs to their own level of learning. This promotes collaboration & communication in the class resulting in greater learning and retention of topics. Are you frustrated with the lack of accuracy in your science lab results? Using a variety of Pasco sensors and I-pads, we can motivate and utilize the skills of Generation Z during our lab periods. Interactive work stations will allow you to collect data with sensors used in chemistry, physics and biology. As well, we will examine how to get this program started in your classes with projects. We will describe how we used TLLP funds to access PASCO datalogging sensors and then describe how we use them in the science, biology, chemistry and physics classroom to engage students and promote inquiry based learning. Participants will get to use the sensors and discuss best practices with our team. Classroom ready resources will also be shared. A crowded curriculum and limited time often drives us toward teacher-directed activities. Participants will explore position, velocity and acceleration, using free software and sensor-equipped dynamics carts. In addition, strategies for increasing time for hands-on activities will be proposed and discussed as a group. SPARKvue 4.0 is here to make data collection and analysis even easier, whether you use Chromebooks, Computers, iPads & iPhones, Android devices, or our standalone dataloggers, the SPARK LX and SPARK LXi. Watch this video for a quick run-through of all the new features. Share experiment files directly to cloud services such as Google Drive or OneDrive. Show only the most recent run data by default. Calibrate and configure sensors through the new hardware setup features. A new Live Data Bar has been created for experiments. The new Welcome Screen gets you up and running even faster. When using Sensor Data, SPARKvue will also guide you to a configuration panel, help you select measurements for display, and let you choose from a range of templates. You can also build your own experiments, open a saved experiment, or open any of the many PASCO built activities. Your one-time purchase of a license or download of the app includes free updates. SPARKvue software is constantly being refined with additional features, streamlined processes, and support for our innovative new products. Much of that improvement comes directly from feedback provided by educators. Download or update to the latest version: SPARKvue 4.0, released 10/5/2018. Data collection and analysis is an integral part of any science investigation. Whether graphing manually-entered data, collecting real-time data from a sensor, or remotely logging data, SPARKvue software helps you and your students address important science and engineering practices in your labs. Easy-to-use and yet powerful, SPARKvue’s collaborative features make this application ideal for use in and out of the science classroom or lab. Create and export electronic student lab journals. Integrated with cloud-based file-sharing services such as Google Drive, Dropbox and more. Click on your device or devices to see SPARKvue compatibility. Chromebook running ChromeOS 57 or later, USB and Bluetooth Requires iOS 9 or later, compatible with iPhone, iPad, and iPod touch. Android 4.4 or later. Graph data from a sensor and see the results in real time. The new Weather dashboard to monitor atmospheric conditions. Again, for most of my career the supplies I have had access to are the same supplies that came with the school when it was built…back in the 1950s. Trying to modernize my lab has been a challenge but just like the city, things are changing. Glenn Grant has been teaching physics, math and science for 20 years in a small town called Mission, BC. Earlier this year PASCO released a new Wireless Weather Sensor. It collects temperature, humidity, UV, wind, and more. The sensor also has a GPS! The folks at PASCO then embedded ArcGIS into their SPARKvue software that manages the sensors and allows for data analysis and visualization. Of course you can always export your data and load into a map at ArcGIS.com. The all-in-one instrument can record up to 17 different measurements individually or simultaneously! Use the sensor in logging mode with the optional Weather Vane Accessory for long-term monitoring, or use it as a hand-held instrument to study microclimates and record ambient conditions relevant to many biological and environmental phenomena. Originally posted on PASCO’s blog. For the next several day’s attendees used PASCO equipment at two field sites to collect water quality data on the Owengarrif River. Sampling took place at the Upper Torc above the falls and the Lower Torc at the mouth of the river. Here’s a quick video of highlights during the conference – hopefully, we’ll see you there next year! Measuring Carbon Dioxide (CO2) has many applications in the classroom and with the latest advances in technology is easier and more affordable than ever before. Here’s a quick look at some of the cool things you can do with the new Wireless CO2 Sensor! An engaging way to introduce students to the sensor is to use the “closed” environment that you already have access to – your classroom or lab. This is also a great opportunity to use the data logging capabilities of the sensor. Find a central place in the room to place the sensor, ideally suspended above students heads where they can’t exhale onto the sensor. Place the sensor into logging mode, and collect 8-10hrs of data (Figure 1a). Depending on the student density in your room, HVAC, how closed the environment is, you should be able to see fluctuations in the CO2 levels that correspond to the class schedule because all of those students are busy breaking down glucose and producing CO2. Figure 1a. Data from sensor logging over a school day. Students can repeat this test in other locations such as the cafeteria, greenhouse, bathrooms, etc. While there are conflicting standards generally a CO2 concentration of <1,000ppm is desirable and >3,500ppm people will begin to experience physiological effects. Many modern HVAC systems even have their own sensors that will cycle the air to maintain CO2 levels <1,500ppm you can probably tell from the data if you your school or lab has one! With the included sample bottle students’ can use invertebrates, germinating seeds, or other small organisms to quickly collect respiration data. Variation in environmental factors like light or temperature provide easy extensions as well as germination time, species comparisons, body mass, activity level, etc. Extending this setup the sensor can be used with bacterial or yeast solutions, even aquatic species by measuring the gas concentration in the headspace of the container. While a smaller chamber will yield faster results (gas concentration will change faster) sometimes a bigger chamber is needed to study larger organisms or when modeling ecosystems. This is where the wireless design is particularly helpful, the sensor can easily be placed inside any container along with the organism being studied – without any modifications. If you need to run the sensor for longer than about 18hrs, connect it to an external USB power pack or source and the sensor can continue working. To get great photosynthesis data you just need a fresh dark green leaf, the sensor, and the sample bottle. Put the leaf in the bottle, cap it with the sensor and start data collection! Using the sample bottle and a fresh leaf ensures a quick response – data runs of 5-10min! Light vs. Dark and wavelength are simple and relevant manipulations for students to conduct. Figure 5. Photosynthesis using a single Epipremnum sp. Leaf with no filter, blue filter, red, and green applied. Plants exposed to full spectrum CFL bulb for 10min runs. Table 1. Summary of change in rate found from each run of data. In some cases lab experiments aren’t feasible or desirable. It’s easy to take the sensor into the field using a cut bottle, bell jar, or plastic bag to isolate a plant or patch of soil for analysis without disturbing the environment. Firmly press the container into the substrate to create a tight seal and begin collecting data. Students can easily compare different ecosystems to determine if they are a net carbon producer or consumer under conditions. This technique can be repeated in different conditions, times of the day or year to compare results. This same technique combined with the concept of measuring a headspace over a liquid to determine the gas exchange can be used to monitor carbon flux in an aquatic ecosystem. Securing the sensor with a float (or to a fix object) to protect it creates the airspace needed to measure above the water. Collect data for the day to see how a body of water is exchanging carbon with the atmosphere. To streamline the sample collection and measurement of soil samples students can use a section of PVC to collect a consistent volume of substrate and make the measurement in the same chamber. A 6-8in (15-20cm) section of pipe with an inner diameter of ~1.125” (3cm) can be easily pounded into the ground a specified depth to collect the sample. Seal the end of the pipe with some parafilm or plastic wrap and collect the data. Data collection can take place in the field or lab and is easily extended for inquiry. Students can treat the samples with pH buffers, water, drying, salt, pesticides, or other chemicals of interest to determine the impact on microbe respiration. Using a drinking straw and a 1gal (4L) ziplock® bag its easy to capture human respiration data. Here’s a video comparing breath hold time. This same procedure can be used to test other variables, before and after exercise, time of day, etc. With Dissolved CO2 Sleeve students can monitor CO2 in an aquatic environment. The Teflon® material is permeable to CO2 molecules but not to water, creating a much smaller headspace around the sensor with a better response time. While the CO2 is not dissolved when its measured this approach has been validated and tracks with other indicators such as pH (Johnson et al 2010). Â This approach works well in the field and in the lab for photosynthesis and respiration experiments. Below is a picture and some data we collected during betta testing! The use of technology in STEM education is quite important because it supports inquiry learning. 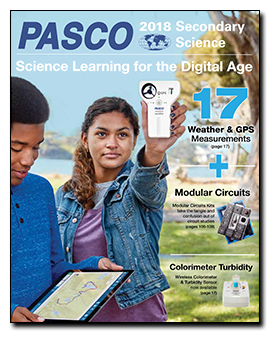 With the newest innovations from science equipment companies such as PASCO, there are even more ways to support inquiry using hands-on learning. In several independent studies, using inquiry-based learning has improved student confidence, interest, and performance in physical sciences. One study in Thailand by Tanahoung, Chitaree, Soankwan, Manjula and Johnston (2009) compared two first year introductory physics classes at the same university. One class was taught using a traditional method while the other class used Interactive Lecture Demonstrations. Interactive Lecture Demonstrations is a form of inquiry; students first predict the outcome of an experiment individually and then in groups. The demonstration is performed in real-time using micro-computer based laboratory tools (in this case a PASCO interface and a temperature sensor) and then students and/or instructor reflect on the concept based on their predictions and the actual results. For each thermodynamics concept, a pre-lecture and a post-lecture test was administered for comparison. Tanahoung et al. found that in almost all of the concepts, there was a greater increased of percentage of correct answers between tests from the experimental group than the control group. These results show that teaching methods that use inquiry and technology are a novel and viable pedagogy for the 21st century. Inquiry-based learning has been shown to improve grades in physical science courses for non-STEM students. In one particular study by Hemraj-Benny and Beckford (2014), a chemistry concepts such as light and matter was taught in relation to visual arts using a combination of traditional lectures and inquiry activities. The experimental group participated in group discussions, performed experiments using worksheets, created presentations, and had a summary lecture from the instructor. In contrast, the control group only had lecture-style lessons in which the instructor went over PowerPoint slides and certain scientific experiments in detail. As a result, the class that received both inquiry and traditional lessons performed better in their final exam than the control group. More students in the experimental group reported better confidence and less fear in science than the control. Interestingly, Heraj and Beckford found that both the control and experimental group reported to have a greater appreciation of the scientific world after completing this course. Overall, this experiment shows that inquiry methods are especially beneficial for non-STEM students in understanding physical sciences. The critical skills taught in this course is an excellent example of how STEM skills can benefit everyone, including non-STEM majors. The use of personal multifunctional chemical analysis systems has greatly improved student perception on chemistry experiments. As reported by Vanatta, Richard-Babb, and Solomon (2010), West Virgina University switched to the PASCO SPARK learning system and reported several benefits to using such systems like “less ‘waiting around time’” (Vannatta, Richard-Babb & Solomon, 2010, p. 772), the possibility of interdisciplinary and field experiments due to the versatility of using such equipment. Such as portability, ease of use and using microcomputer-based laboratories allows students to move at their own pace instead of waiting for others to move on. All of these benefits are factors to increased student retention and interest in chemistry majors. Additionally, PASCO has upgraded from the portable SPARK learning system with built-in software to the downloadable SPARKvue software for computers and mobile devices. 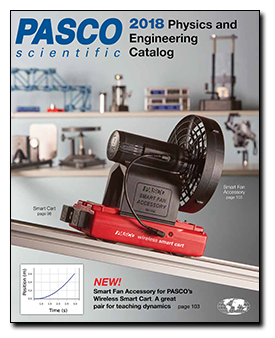 In another study, Priest, Pyke, and Williamson (2014) compare student perception using a handheld datalogger (the PASCO GLX system) versus SPARKvue on a laptop for the same chemistry experiment. Students were surveyed after using the GLX system for a vapour pressure experiment on their opinion on the lab. The next year, the school had phased out the GLX system and introduced SPARKvue using a laptop interface but kept the lab exactly the same. Researchers noticed more positive responses to the experiment when students used the laptop interface. Students perceived that the experiment was simpler and that the content was easier to understand when using SPARKvue because students are more familiar with a laptop and not a traditional datalogger, they experienced less frustration and spent less time learning how to use the necessary software to gather data. A Guided Inquiry Lab – Results May Vary! In my own studies, I benefited from inquiry labs and technology definitely made these labs easier. One of my favourite labs was a dart gun experiment where our groups were challenged to determine the theoretical spring constant of a dollar store dart gun by devising our own method. The goal of the experiment wasn’t to determine the actual spring constant since there weren’t actual springs in the dart gun, but to use what we knew from other units to create an experiment. We were given free reign over all the equipment in the classroom including the PASCO GLX and motion sensor and needed to keep a lab notebook in order to note any changes to the experimental method. My partner and I opted for a low-tech option (pictured right) – we weighed the dart and determined the maximum height of its flight upwards so we could plug it into a kinematics equation to find the vertical velocity of the dart when it exited the chamber. This method was sort of tedious – I would launch the dart from the floor while my friend would video the dart on her phone while standing on a chair so we could replay and record when it reaches maximum height. This resulted in a few mishaps such as the dart perfectly falling into the adjacent broken glass box which we promptly moved. 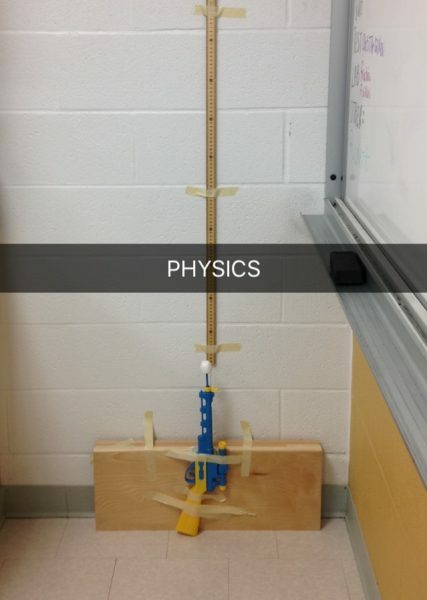 We also had to make several modifications to our experiment design to ensure that our data collection was consistent such as taping the dart gun so it exits perpendicular to the ground and adding weight to the dart gun so it doesn’t hit the ceiling before it reached its maximum height. Another group decided on the easier (and safer) option of using the GLX and motion sensor to capture the horizontal acceleration of the dart when launched off of the table to model a Type 1 Projectile Motion problem. This method reduced a lot of uncertainty in their calculations since the sensors could accurately capture their data and they had the added benefit of not needing to precariously stand on a chair and guess-timate the maximum height. 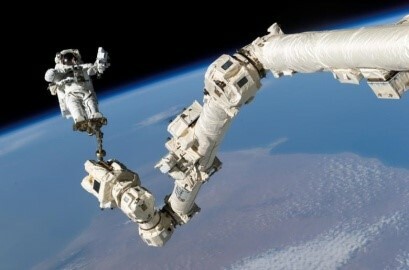 They also managed to finish a lot earlier and have more experimental runs than we did. Although the sensors did end up making the experiment a lot easier for them, both of our groups were able to make connections between units and truly use the scientific method which made the experiment so much more interesting than our usual structured inquiry labs. From these studies it is clear that inquiry-based learning and technology in STEM classrooms have short-term benefits such as increasing student interest and confidence. In addition, these two approaches to learning are complimentary to each other. The ease of use from technology decreases wait times and allows students to move at their own pace. Because students can move at their own pace, they are able to ask questions about the experiment itself. Students are able to benefit from making mistakes in this environment because the data logging software allows them to analyze what they did incorrect and why it is happening. Through this approach, students are able to be curious in a controlled environment whilst developing essential scientific inquiry skills. There is also more time for meaningful discussion during class through using probeware since it reduces the amount of set up and lessons on how to use the equipment. Because of this, students are less likely to get frustrated or bored from experiments and helps students understand or reinforce their knowledge in the subject. 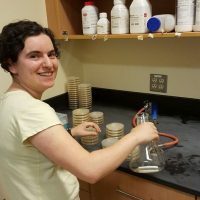 This could improve the number of students pursuing a science education since students are less likely to leave if they are interested and confident in what they are learning. PASCO and AYVA have a significant amount of resources that further demonstrates the positive impact that probeware technology has in science education such as White Papers on how PASCO supports scientific inquiry. AYVA also provides Curriculum Correlations for Canadian provinces which provides suggestions on how to incorporate PASCO technology into science classrooms across Canada. Priest, S.J., Pyke, S.M., & Williamson, N.M. (2014). Student Perceptions of Chemistry Experiments with Different Technological Interfaces: A Comparative Study. Journal of Chemical Education, 91, p.1787-1795. Tanahoung, C., Chitaree, R., Soankwan, C., Sharma, M.D., & Johnston, I.D., (2009). The effect of Interactive Lecture Demonstrations on students’ understanding of heat and temperature: a study from Thailand. Research in Science & Technological Education, 27(1), p. 61-74. Vannatta, M.W., Richards-Babb, M., & Solomon, S.D. (2010). Personal Multifunctional Chemical Analysis Systems for Undergraduate Chemistry Laboratory Curricula. Joural of Chemical Education, 87(8), p. 770-772. In my high school years I found that many of my classmates hesitated in pursuing science and engineering because of the ‘M’ in STEM. Math. When I was younger I didn’t really understand why everybody hated math so much – in my opinion it was more fun than having to draw (I’m a pretty bad artist). It also helps that I had a good teacher in grade 5 and 6 that gave me a healthy respect for math. Her math tests were infamous for being long and difficult but it helped me develop the necessary skills to succeed in high school. I find that the biggest issue for students is that they have a negative view towards studying STEM and it’s a result of years of conditioning from teachers, parents, and peers telling them that the content is difficult to learn. Although it is not intentional, it has a significant effect on a student when they start thinking about what career they want to pursue. EEK IT’S A PARABOLA! Oh wait it’s just a ghost. Although Math is its own discipline in STEM, all the other disciplines (science, technology, and engineering) inevitably involves math in some way. So many students have a fear of math and will avoid certain disciplines because it requires math. Quite often I would hear my classmates say that they won’t apply to a specific post-secondary program because it requires grade 12 calculus. This fear of math is so prevalent in our culture that it is almost like a badge of honour to say that you’re “not a math person”. My first year calculus professor has a good blog posts (here and here) that outlines why math anxiety can be detrimental and has other math resources and activities for teachers. This applies for teachers as well – showing fear of math or any other subject can greatly affect how a student perceives that subject. In order to address this problem, STEM education for pre-service teachers must be improved. In one study by Gado, Ferguson, and van’t Hooft (2006), pre-service chemistry teachers were taught using probeware in their experiments which resulted in greater confidence in these subjects. By having more confidence in teaching the content, the teachers are less likely to project a fear of STEM but instead an interest and enthusiasm for the subject. 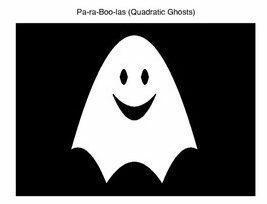 Using mathematical concepts in science is an effective way to make math seem less like a scary ghost. There are many ways to help your students reinforce their math skills within science lessons. With the use of probeware with built-in graphing software, math can be readily applied to real-life concepts thus helping students understand concepts both numerically and visually. It also explains math in a different way that some students may find more understandable. I think this negative attitude towards math and difficult subjects in general comes from the fear of failure. Acceptance into post-secondary education heavily relies on what grades students have and having a low score in a course could influence whether or not they get into a certain university program. I admit that I didn’t want to take physics or calculus because I knew that it would lower my acceptance average since they were quite difficult subjects. What I learned from these courses was far more valuable to me than a few percentage points and I’m not talking about derivatives and quantum physics. I learned how to fail in physics and calculus. I did have a fear of failure – the thought of even getting a 70 in a course was terrifying for me until grade 11. Learning new things was always easy for me and failure was never an option for the overachieving 16 year old me. I failed a test in high school for the first time in my grade 11 physics class which was absolutely devastating. After some tears I picked myself up and tried to figure out where I went wrong. Obviously my study skills at the time weren’t effective so I had to develop different skills that would suit this type of course. I learned from my mistakes and tried harder. I ended up finishing that class with a 90 and an important life lesson. I learned that failing is okay as long as you learn from your failures. This is something that I didn’t really understand until I actually experienced it. Although something is considered difficult or you think that you might not be good at it, it shouldn’t prevent you from at least trying. There is always something to learn from failure, even if it’s simply the confirmation that something is definitely not suited for you. This applies not only to STEM but in life. In order for more students to pursue a STEM education, we need to start encouraging students to get out of their comfort zone and challenge themselves in areas that they are not as strong in even if they may fail. 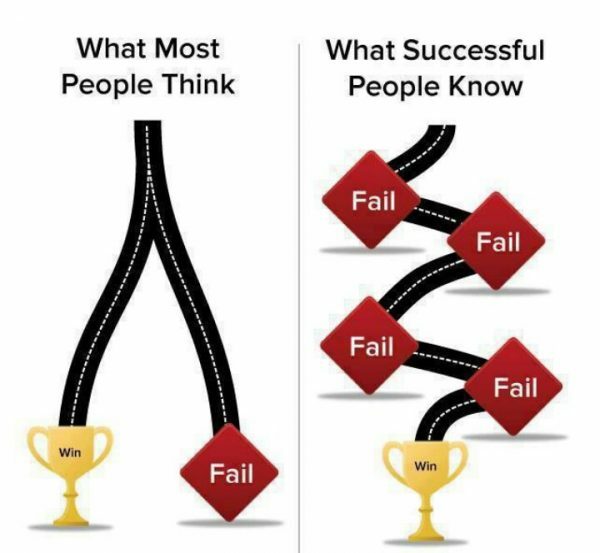 Remember, failure is an option! Gado, I., Ferguson, R., & van’t Hooft, M. (2006). Using handheld-computers and probeware in a Science Methods course: preservice teachers’ attitudes and self-efficacy. Journal of Technology and Teacher Education, 14(3), p. 501+.